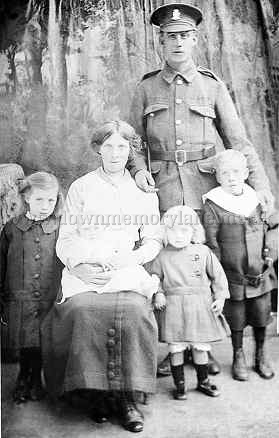 Standing proudly in his Royal Irish Rifles uniform is Robert Woods and seated with a baby is his wife Sarah Jane Woods. The children are unknown and so is the year. 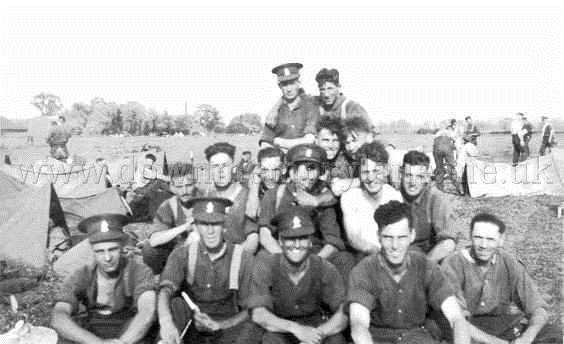 These brave young unknown men of the Royal Irish Rifles are in a temporary camp on the outskirts of Randalstown during the First World War. Look at the smiles, the eagerness and excitement on their faces not knowing the horrors that waited for them on the Western Front. I wonder did any of them come back? Here we are at one of the army camps just outside Randalstown. 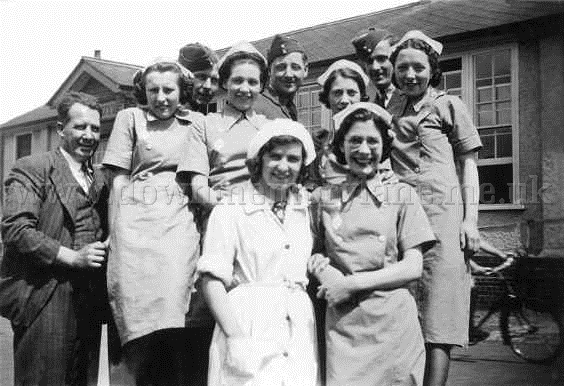 The three service men are being photographed with these ladies who are the canteen staff and that is their boss on the left. The only lady known is in the middle row and second from the left. Her name is Rachel Woods known to her friends as Rea who later married Dan Lyttle. All smiles for the camera when out for a walk at Randalstown. 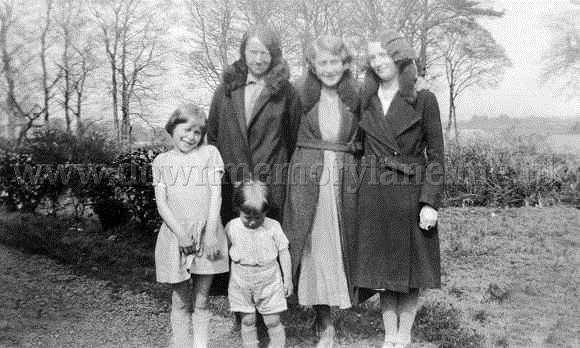 On the left we have Granny Woods nee Brown in the Centre Molly Woods and finally Eileen Brown. Although the sun is shining and the children are in summer clothes the ladies are wrapped up in their long coats with fur collars. 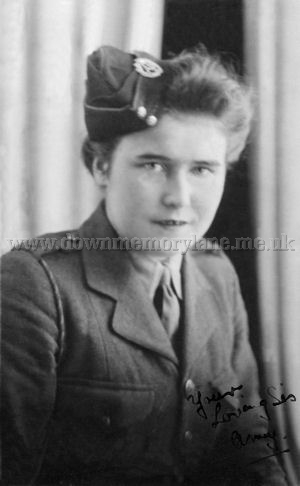 It's 25th October 1945 and this is Blossom McCaughey who was in the women's Auxitiary Territorial Service and was the aged 18.
as he felt that they would not be able to cope with the knowledge that they might have shot down and killed young German men. By July 1942, the ATS had 217,000 women in it. As the war dragged on, women in the ATS were allowed to do more exciting jobs such as become welders (unheard of in civvie street), carpenters, electricians etc. Blossom had written on the photo: Your Loving Sis Amey. 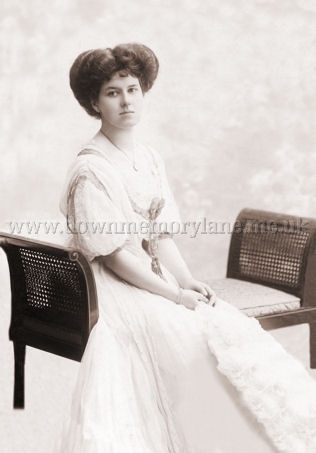 This is Allie O'Neill on the 29th November 1909 have her portrait taken. It was taken at Sallie Charles which was in Curzon Street, Mayfair in London. 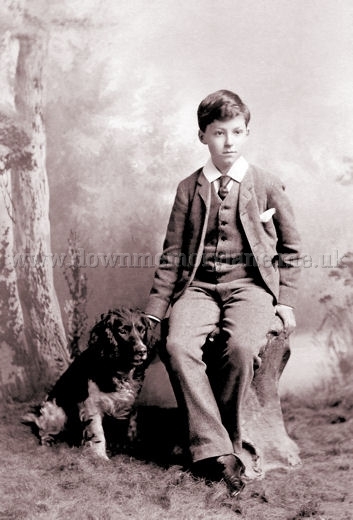 Sitting getting his portrait taken in a studio in Folkestone in 1890 is Arthur O'Neill and at his side is his faithful dog Bell. Arthur in later years became Lord O'Neill and a member of Parliament. Then came the Great War and sadly Lord O'Neill was killed in action in 1914. 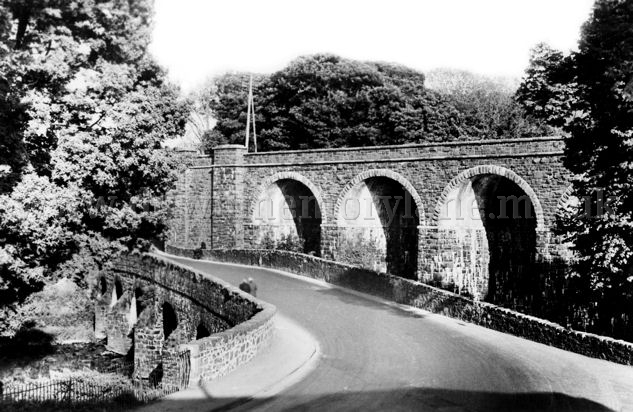 It's 1949 and the hustle and bustle of the morning has given way to a quiet afternoon in Randalstown. As this couple slowly make their way to the shops while on the other side is a young boy sitting on the wall passing the time away. 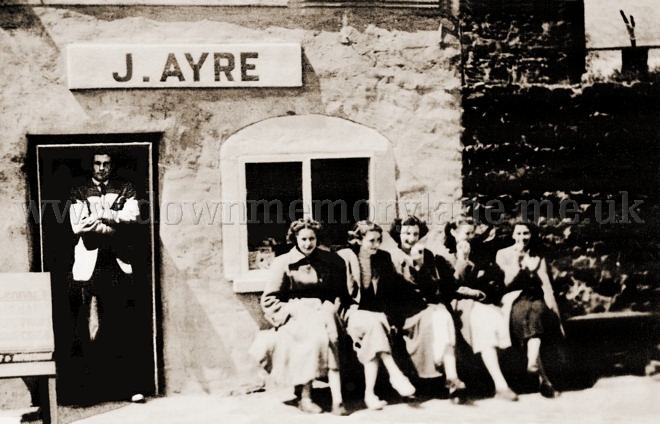 Well here we are in Randalstown in the 50's down Moore's Lane outside James Ayre's shop and he is standing in the doorway and his late wife Martha helped James in the Shop in which they sold everything from a goldfish to ice-cream. Now sitting on the wall outside the shop are five girls having their lunch-break and the three on the right are eating apples, probably bought in the shop. The girls are unknown, but if you know them please let me know. 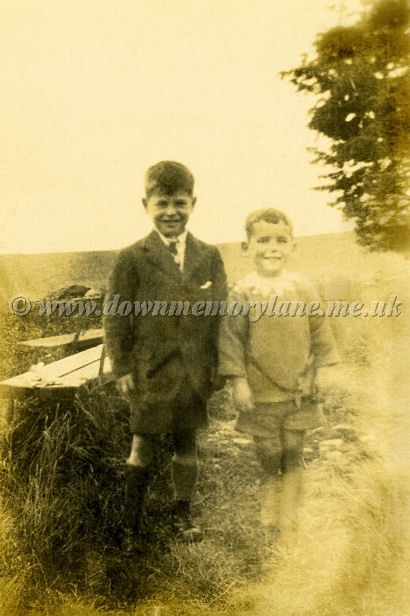 Out here in the countryside in August 1942 after having something to eat we have two happy smiling boys Edward and Michael Archibald. 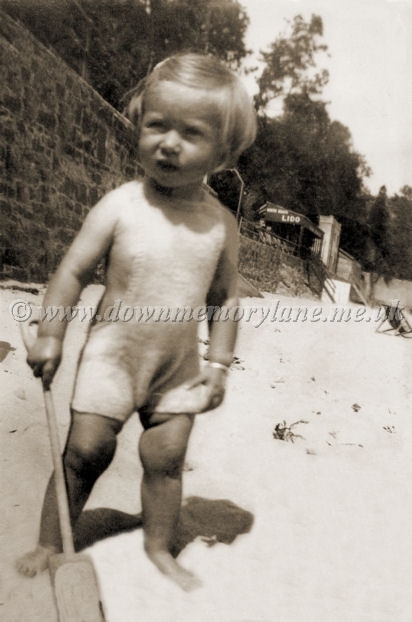 Looking for somebody to play with her is young Anne back on the 27th August 1940 with her spade and one piece woolen swim suit. If you know her last name please contact me.